ON 2 August 1927, on a summer trip in South Dakota, President Calvin Coolidge distributed to reporters copies of a simple message: "I do not choose to run for President in nineteen twenty-eight." He was quietly departing from a presidency that had quietly watched over a country enjoying what seemed to be permanent prosperity, rejoicing in seemingly limitless technological and scientific progress, and enormously proud of its institutions. 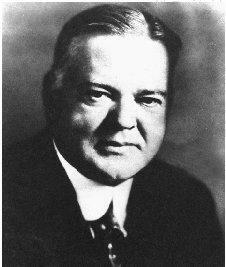 In Secretary of Commerce Herbert Hoover—an engineer, businessman, humanitarian, administrator, and in many respects political progressive—the nation saw a figure whose brilliantly successful career embodied its technical and economic talents, its generosity, its mythic story of the poor boy whose hard work brings him fame and wealth. Hoover would be the fitting Republican candidate and successor to Coolidge. The campaign, with Charles Curtis as vice presidential candidate on Hoover's ticket, was all that the Republicans could have wanted. Governor Alfred E. Smith of New York, the Democratic candidate, had the political liability of his Roman Catholicism, which he compounded by appointing a Catholic to be Democratic national chairman. Smith blundered, or at any rate was stubbornly intractable, in his handling of the religious issue. He failed during the campaign to address specifically the fears of those Americans who thought of his religion as alien to the American tradition, and he acted as though any questions about his faith were an affront to be brushed aside. Further, although Smith opposed Prohibition at a time when it was proving itself a failure, this deepened the public perception of him as an eastern urbanite fixed to his Catholic ethnic constituency. Hoover's campaign looked toward an end to poverty, equivocated on Prohibition by calling it an experiment, and promised farmers an agricultural marketing act. But no matter who the Democratic candidate might have been or how the campaign might have proceeded, Hoover had on his side a national prosperity that was irresistible politically. Hoover received 21 million votes, and Smith, 15 million. The electoral vote was divided 444 to 87. Biographies include David Burner, Herbert Hoover: A Public Life (New York, 1979); Joan Hoff Wilson, Herbert Hoover: Forgotten Progressive (Boston, 1975); Martin L. Fausold, The Presidency of Herbert C. Hoover (Lawrence, Kans., 1985); Wilton Eckley, Herbert Hoover (Boston, 1980); and Richard Norton Smith, An Uncommon Man: The Triumph of Herbert Hoover (New York, 1984). All of these books are being gradually supplanted, at least in matters of detail, by George H. Nash's multivolume life. So far two volumes by Nash have appeared under the main title The Life of Herbert Hoover: vol. 1, The Engineer (New York, 1983), and vol. 2, The Humanitarian, 1914–1917 (New York, 1988). See the following two books by Ellis W. Hawley, the most influential scholar of Hoover studies: Herbert Hoover as Secretary of Commerce: Studies in New Era Thought and Practice (Iowa City, Iowa, 1981) and Herbert Hoover and the Historians (West Branch, Iowa, 1989). Hawley has also edited Herbert Hoover: Containing the Public Messages, Speeches, and Statements of the President , 4 vols. (Washington, D.C., 1974–1977). There are three bibliographies about Hoover: Patrick G. O'Brien, comp., Herbert Hoover: A Bibliography (Westport, Conn., 1993); Richard D. Burns, comp., Herbert Hoover: A Bibliography of His Times and Presidency (Wilmington, Del., 1991); and Kathleen Tracey, comp., Herbert Hoover, a Bibliography: His Writings and Addresses (Stanford, Calif., 1977). Other important monographs include Donald J. Lisio, The President and Protest: Hoover, MacArthur, and the Bonus Riot , 2d ed. (New York, 1994), and his Hoover, Blacks, and Lily-whites: A Study of Southern Strategies (Chapel Hill, N.C., 1985); James S. Olson, Herbert Hoover and the Reconstruction Finance Corporation, 1931–1933 (Ames, Iowa, 1977), and his Saving Capitalism: The Reconstruction Finance Corporation and the New Deal, 1933–1940 (Princeton, N.J., 1988); Gary Dean Best, The Politics of American Individualism: Herbert Hoover in Transition, 1918–1921 (Westport, Conn., 1975), and his Herbert Hoover: The Postpresidential Years, 1933–1964 (Stanford, Calif., 1983); Albert U. Romasco, The Poverty of Abundance: Hoover, the Nation, the Depression (New York, 1965); Craig Lloyd, Aggressive Introvert: A Study of Herbert Hoover and Public Relations Management, 1912–1932 (Columbus, Ohio, 1972); James D. Calder, The Origins and Development of Federal Crime Control Policy: Herbert Hoover's Initiatives (Westport, Conn., 1993); George H. Nash, Herbert Hoover and Stanford University (Stanford, Calif., 1988); and Allan J. Lichtman, Prejudice and the Old Politics: The Presidential Election of 1928 (Chapel Hill, N.C., 1979). Important collections of essays include Lawrence E. Gelfand, ed., Herbert Hoover: The Great War and Its Aftermath, 1914–1923 (Iowa City, Iowa, 1979); Lee Nash, ed., Understanding Herbert Hoover: Ten Perspectives (Stanford, Calif., 1987); and Martin L. Fausold and George T. Mazuzan, eds., The Hoover Presidency: A Reappraisal (Albany, N.Y., 1974). Recent works include Louis W. Liebovich, Bylines in Despair: Herbert Hoover, the Great Depression, and the U.S. News Media (Westport, Conn., 1994). i've learned alot about herbert hoover. i wish i could have learned alot more about him.